When you are running a high traffic site, you may hit the Google Analytics processing limit. 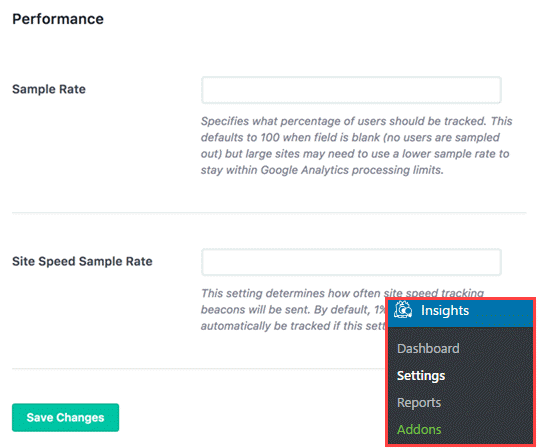 To stay within that limit, MonsterInsights performance addon gives you the ability to make sample rate and site speed sample rate adjustments. This allows you to specify what percentage of users should be tracked, so you can stay within Google Analytics’ processing limit. The Site Speed Sample rate setting allows you to configure how often site speed tracking beacons will be sent which defaults to 1% of users automatically. In the future, our goal is to give you the ability to control complete site load analysis. We took the pain out of integrating Google Analytics with WordPress and made it easy.